Methods used to estimate the potential economic effects of climate change in the United States—using linked climate science and economics models—are based on developing research. The methods and the studies that use them produce imprecise results because of modeling and other limitations but can convey insight into potential climate damages across sectors in the United States. The two available national-scale studies that examine the economic effects of climate change across U.S. sectors, including the Impact Lab team’s American Climate Prospectus, suggested that potential economic effects could be significant and unevenly distributed across sectors and regions. For example, for 2020 through 2039, one study estimated between $4 billion and $6 billion in annual coastal property damages from sea level rise and more frequent and intense storms. Also, under this study, the Southeast likely faces greater effects than other regions because of coastal property damages. Information about the potential economic effects of climate change could inform decision makers about significant potential damages in different U.S. sectors or regions. According to several experts and prior GAO work, this information could help federal decision makers identify significant climate risks as an initial step toward managing such risks. This is consistent with, for example, National Academies leading practices, which call for climate change risk management efforts that focus on where immediate attention is needed. The federal government has not undertaken strategic government-wide planning to manage climate risks by using information on the potential economic effects of climate change to identify significant risks and craft appropriate federal responses. By using such information, the federal government could take an initial step in establishing government-wide priorities to manage such risks. Solomon Hsiang, Robert Kopp, Amir Jina, Michael Delgado, James Rising, Shashank Mohan, Robert Muir-Wood, D. J. Rasmussen, Michael Mastrandrea, Paul Wilson, Kate Larsen and Trevor Houser (2014). 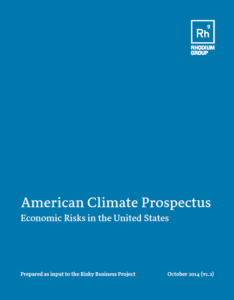 American Climate Prospectus: Economic Risks in the United States. The American Climate Prospectus (ACP) provides a groundbreaking new analysis of climate risks by region of the country and sector of the economy. By linking state-of-the-art climate models with econometric research of human responses to climate variability and cutting edge private sector risk assessment tools, the ACP offers decision-makers a data driven assessment of the specific risks they face.